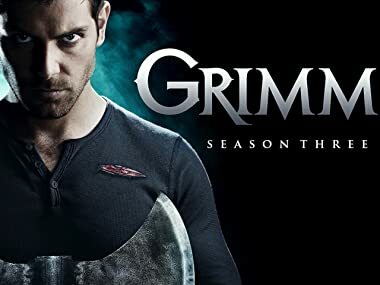 The hunter becomes the hunted in season 3 of Grimm, as Detective Nick Burkhardt and his crew continue to battle fairy tale creatures - which are more real than we ever imagined. Nick's destiny is uncertain as zombies continue to overrun Portland. The man hunt for Nick escalates. An age old feud reaches explosive new heights. Bizarre drownings lead to a mysterious group of water-bound wesen. Nick (David Giuntoli) and Hank (Russell Hornsby) are on the case as repeat instances of apparent vigilantism have whispers of an old Spanish legend making their way through a working-class Portland neighborhood. Elsewhere, Juliette (Bitsie Tulloch) learns the truth about Nick's mother. Meanwhile, Adalind (Claire Coffee) has a brief scare during her ultrasound. Nick (David Giuntoli) faces his toughest challenge yet when he and Hank (Russell Hornsby) investigate a case that combines religious phenomenon with the dark dealings of the Wesen Council. Meanwhile, Rosalee (Bree Turner) is torn when Nick's case challenges her Wesen loyalties. Elsewhere, Captain Renard (Sasha Roiz) leaves town to tend to some "family matters." As a deadly crime spree begins to surface, a century-old urban legend takes shape in Portland's sewers and becomes Nick's (David Giuntoli) latest case. In Europe, Adalind (Claire Coffee) meets Prince Viktor (guest star Alexis Denisof), who's come to bring those responsible for his cousin Eric's demise to justice. Meanwhile, Captain Renard (Sasha Roiz) responds to the recent attempt on his life. A dark justice descends on Portland as the Christmas season begins. A Wesen with a unique ability is at the center of a revenge fueled investigation. Nick (David Giuntoli) and Hank (Russell Hornsby) are called to the scene of a gang-related homicide. The case escalates as Zuri (guest star Sharon Leal), Hank’s physical therapist, and her brother get caught up in the investigation. Meanwhile, Juliette (Bitsie Tulloch) seeks advice from Rosalee (Bree Turner) in dealing with the news that her friend is Wesen. Nick and Hank investigate a series of veteran murders while Monroe meets Rosalee’s family for the first time. A serial killer with a penchant for collecting scalps is unleashed on Portland and Monroe has an important question for Rosalee. The search for a scalp collecting serial killer continues as Monroe’s battle at home intensifies. A horrible new predator creeps into Portland with its sight set on a young expectant couple who are close friends of Sgt. Wu (Reggie Lee). Nick (David Giuntoli) and Hank (Russell Hornsby) must figure out how to deal with Wu as the investigation escalates. Meanwhile, Adalind (Claire Coffee) prepares for a special delivery while her enemies are hot on her trail. An ancient Egyptian mystery causes chaos in Portland. A Wesen carnival comes to Portland. The Resistance's plan to keep Adalind (Claire Coffee) safe gets kicked into high gear when an unexpected ally arrives to ensure she and the baby make it out of Europe safely. In Portland, as Monroe (Silas Weir Mitchell) and Rosalee (Bree Turner) prepare for their upcoming wedding, Nick (David Giuntoli) and Juliette (Bitsie Tulloch) are reminded of their failed proposal. Nick (David Giuntoli) and his mom, Kelly Burkhardt (guest star Mary Elizabeth Mastrantonio), join forces to protect Adalind's (Claire Coffee) baby. Meanwhile, Prince Viktor (guest star Alexis Denisof) activates a deadly stateside asset (guest star C. Thomas Howell) to find Adalind and her child. Nick (David Giuntoli) and Hank (Russell Hornsby) investigate a dangerous female suspect (guest star Jacqueline Toboni) leaving a trail of Wesen in her wake. Elsewhere, Adalind (Claire Coffee) takes measures into her own hands, even if that means forging a dangerous alliance. Nick and Hank take Trubel on a ride along. A mysterious duo comes to Portland in search of Nick -- C. Thomas Howell and Jacqueline Toboni guest star. Monroe and Rosalee's big day has finally arrived.